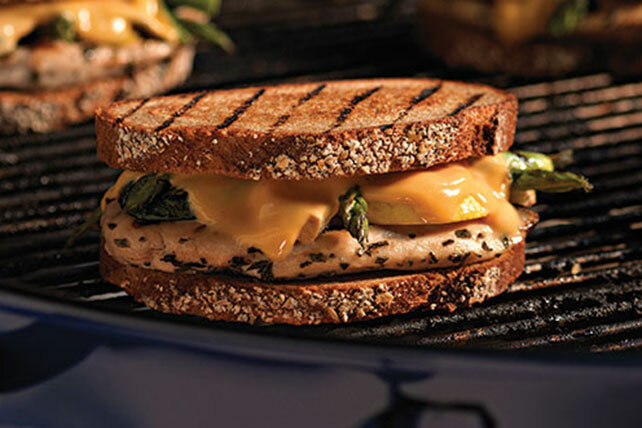 Herbs, garlic and spring's best vegetables dress up this cheesy grilled chicken sandwich. Place chicken in shallow dish. Mix herbs, garlic and oil until blended; pour over chicken. Turn chicken to evenly coat both sides of each breast. Refrigerate 30 min. to marinate. Heat grill to medium heat. Remove chicken from marinade; discard marinade. Grill chicken 5 min. ; turn. Add vegetables; grill 5 min. or until chicken is done (165ºF) and vegetables are crisp-tender, turning vegetables occasionally. Fill bread slices with chicken, vegetables and Singles to make 4 sandwiches. Spread outsides of sandwiches with mayo. Grill 3 to 5 min. on each side or until golden brown on both sides. Spice up your mealtime with these easy-to-make sandwiches. Serve with your favorite fresh fruit to round out the meal. Substitute 1/2 cup KRAFT Balsamic Vinaigrette Dressing for the homemade marinade.